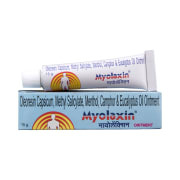 Myolaxin Ointment is used to relieve pain associated with muscle or joint injuries such as sprains, strains, or sports injuries. It also relieves pain from rheumatoid arthritis, osteoarthritis etc. It contains Methyl salicylate, Menthol, Camphor, Eucalyptus oil and Capsaicin. Methyl Salicylate is Counterirritant which inflames the affected part, improves blood flow, makes warmth the affected part and enhances deeper penetration of the drug (capsaicin) hence works faster. Capsaicin is derived from capsicum. Capsaicin help in relieve from pain and inflammation. It stimulates the release of a compound involved in communicating pain between the nerves in the spinal cord and other parts of the body thus decreases the intensity of pain signals in the body. Camphor and Eucalyptus oil has good odour, local anaesthetic action property. Caution: Do not apply to broken skin and excessively raw areas. Apply Myolaxin ointment by hand and gently massage the ointment into the area of pain or stiffness and on the surrounding area until the gel has been absorbed. Note: It is normal for the skin to redden as a result of the increased circulation to the affected area. Dosage: Treatment should be repeated two to three times a day. A licensed pharmacy from your nearest location will deliver Myolaxin Ointment. Once the pharmacy accepts your order, the details of the pharmacy will be shared with you. Acceptance of your order is based on the validity of your prescription and the availability of this medicine.